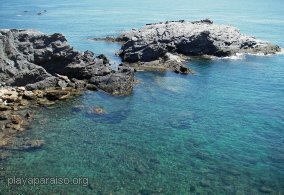 This is a short walk from the Cabo de Palos lighthouse, to the harbour, in time for lunch. 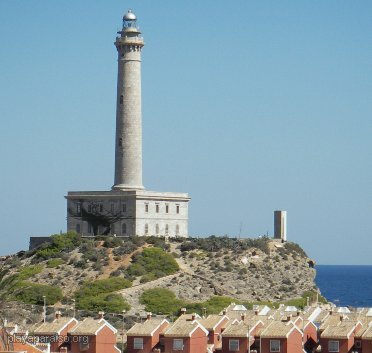 If you haven't visited the lighthouse before, then it is worth a walk up the hill to have a look around. The building and the view are both very impressive, but there is very little information explaining what you're looking at. The walk from the lighthouse to the harbour takes about twenty minutes, The path is fairly rough, but nothing really difficult. Most of the route is along low cliffs, in front of houses. Facing the entrance gates to the lighthouse, follow the road that goes in front of it along to the right. This goes up hill to a headland (where there is more parking) and at the top the footpath leads off to the right. You just follow it to Cabo. 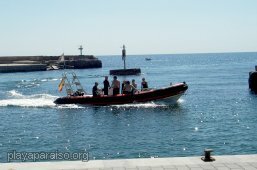 On the way you will pass several small bays, that are popular with divers and fishermen. 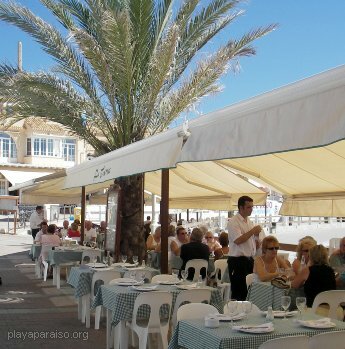 If it's a warm day and you time it right, you will arrive at Cabo harbour at the right time to enjoy lunch at a seafront restaurant, followed by an ice cream on the walk back. At lunch time the harbour is often busy with returning fishing and diving boats.